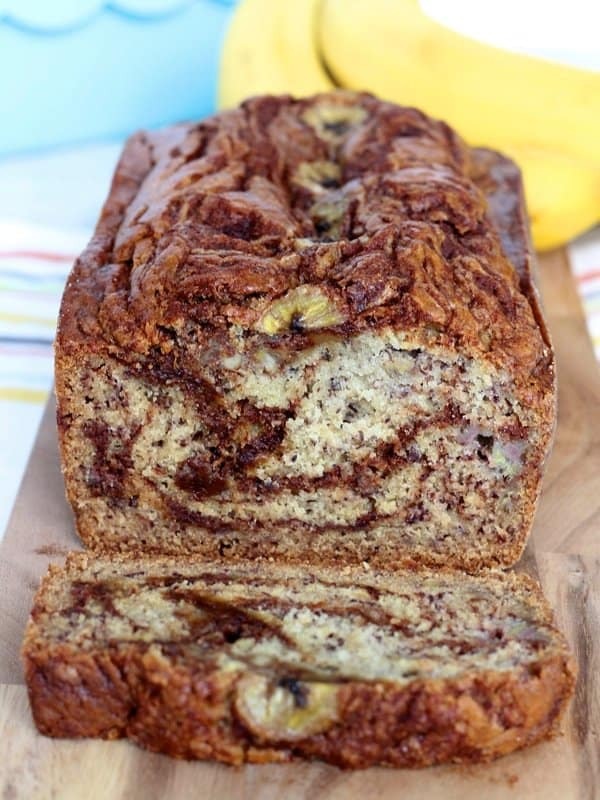 Swirls of buttery cinnamon sugar swim throughout the moistest banana bread that’s out of this world delicious! Please tell me you have some ripe bananas on your counter?! 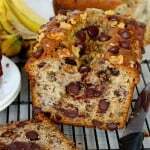 I sure hope so because this banana bread is the best and it’s calling your name! I’ve baked and consumed a lot of banana bread in my days and this loaf of love is right up there with the greatest I’ve ever eaten. It’s incredible! 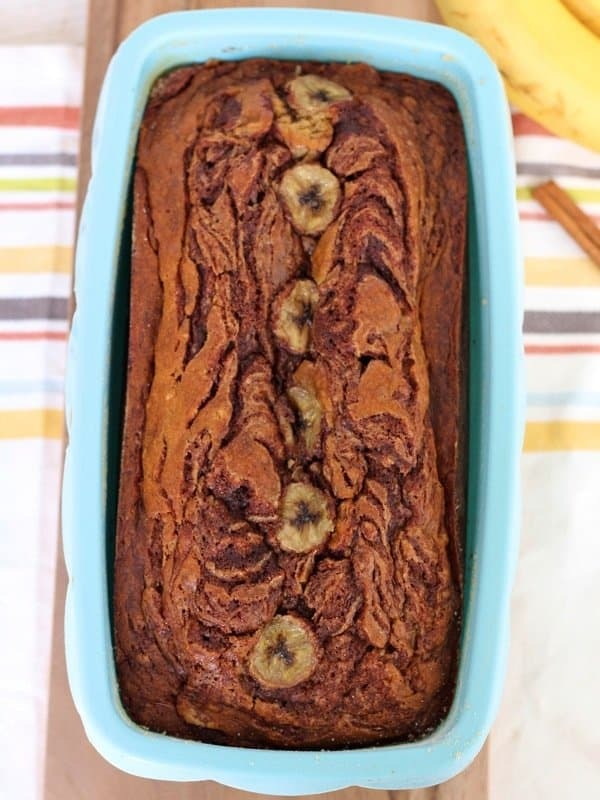 Swirls of buttery cinnamon sugar swim throughout the moistest banana bread with the most amazingly sweet crust that’s out of this world delicious! 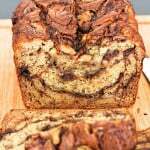 It’s like a cinnamon roll crashed into a loaf of banana bread and it turned into one of my tastiest creations! I can’t wait to bake it again and again for breakfasts, snacks, parties and gifts. It’s pure love from the oven! 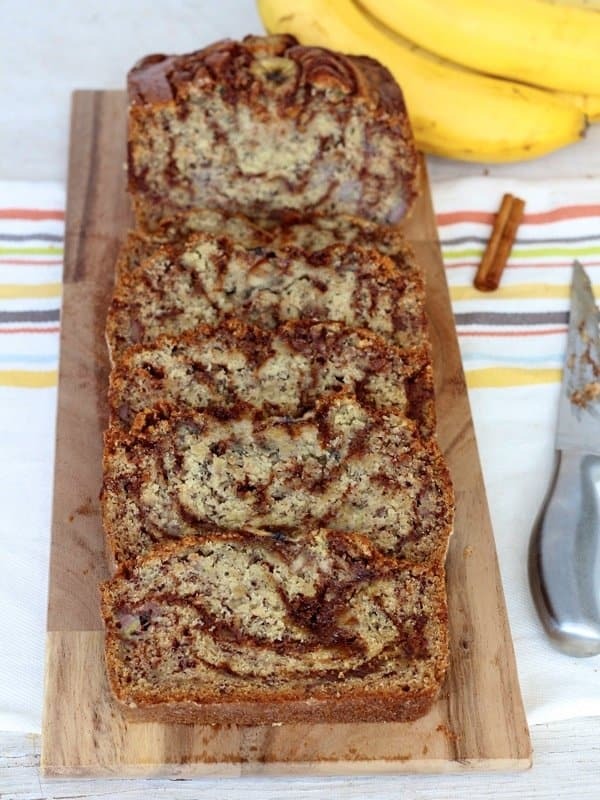 I hope you have some bananas on hand so you can bake this beauty as soon as possible! Enjoy! 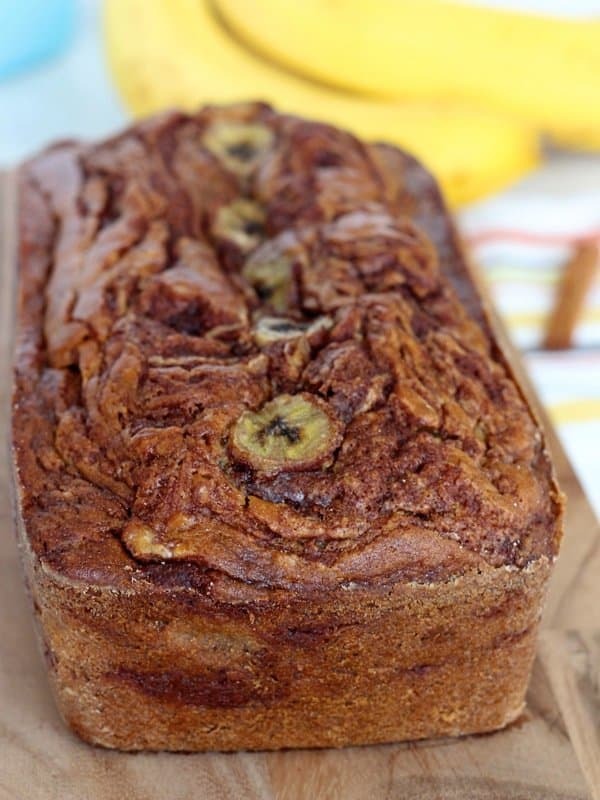 Swirls of buttery cinnamon sugar swim throughout the moistest banana bread that's out of this world delicious! Preheat oven to 350°F. Lightly grease and flour a 9x5-inch loaf pan and set aside. In a large bowl, melt the butter and let cool slightly. Whisk in the sugar then the eggs and vanilla. Stir in the flour and baking soda. Fold in the mashed bananas until just combined. In a small bowl, use a fork to stir together the cinnamon sugar swirl ingredients until thick and well combined. Spread ¼ of the batter evenly into the bottom of the prepared pan. Dollop ¼ of the cinnamon sugar mixture over the batter in the pan and then make a nice thick swirl through the batter with a table knife or bottom of a wooden spoon. Place ⅓ of the remaining batter evenly over the first layer and swirl with ⅓ of the remaining cinnamon sugar mixture. Place ½ of the remaining batter evenly over the second layer and swirl with ½ of the remaining cinnamon sugar mixture. Spread the remaining batter evenly over the top and dollop with the remaining cinnamon sugar mixture. Make large swirls throughout the entire loaf. Place six thin banana slices down the middle of the batter. Place loaf pan on a baking sheet and bake for 60-70 minutes or until golden brown and a toothpick inserted in the center comes out clean. Let the bread cool in the pan for at least 30 minutes before removing to a wire rack to cool completely. The swirls in this are amazing! Love that these two crashed into each other to form this beauty. So great! Thanks Matt! It’s our new favorite banana bread! I keep bananas in my freezer for this exact reason! Making this tomorrow morning!! Ohhhh, that swirl! Love the flavors in this bread! Thanks Christine! It’s our new fave! I’m making mine as I type this. Can’t wait to try it. I wasn’t looking for a banana bread recipe but just had to make it. It’s in the oven right now. Hopefully it tastes as good as the batter did. I am interested in using this recipe and placing it in four mini loaf pans. I would appreciate any ideas on how long to bake the four mini loaf pans of cinnamon swirl banana bread. Thank you! Hi Sharon! When I bake mini loaves of banana bread, it usually takes around 30 minutes. I would start peeking in on them around 25 minutes and then start checking them with a toothpick once they’ve risen well and start to brown on top. Hope this helps. Enjoy! Thank you so much for your guidance; I plan to make the bread this afternoon. I appreciate you taking the time to respond so quickly. Merry Christmas to you and your family. Easy and absolutely delicious…Definitely a winner! 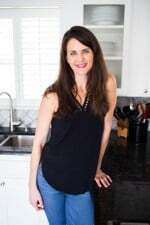 Thank you for posting this recipe, my family & I loved it! Ridiculously delicious. 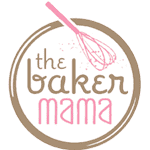 The best banana bread ever! I just made this bread. The edges were delicious but the middle never czoomed. If I left it in any longer the whole thing would have burned. Not sure what I did wrong. It also overflowed the loaf pan too. Hi Amy! So sorry to hear this. Did you use a 9×5-inch loaf pan. Was it too high up in the oven as it was baking? Oven temperatures definitely vary so if you notice it browning on top, but the toothpick doesn’t come out clean when inserted in the center, tent the loaf with foil and let it continue to bake until a toothpick inserted in the center comes out clean. I just made this banana bread. Hands down the very best banana bread recipe ever. Thank you! After you posted this on Facebook I went right out, bought bananas and have been waiting patiently for them to turn brown. I made it this afternoon and it was AMAZING! Good work! Love it! Very few out there that spell it our way. 🙂 Enjoy the bread! It’s amazing! Just checking before I finish these off, it is 2 Tablespoons of cinnamon in the swirl, not 2 teaspoons? – I just don’t want to mess it up and 2 TBSP seems like a lot. Hi Carra! Yes, it’s 2 tablespoons. 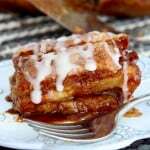 It balances perfectly with the sugars for a nice thick cinnamon-y swirl. Enjoy! Do you really need to place the loaf pan on a baking sheet for baking? What does this do? Hi Dianne! 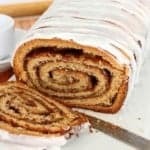 I usually do because the cinnamon sugar can sometimes bubble up with the loaf and slightly drip down the sides and onto the bottom of the oven. Hope this helps. Enjoy! Thanks for your suggestion. I don’t want a mess in my oven either. I am baking this tomorrow for a work meeting Wed morning. It looks delicious. Hi Jennifer! I’m wondering if you didn’t swirl it in enough. Was there too much swirl in the middle weighing it down? I call this “Banana Crack”: we could NOT stop eating it. I could not tell you if it was lower in the middle. Lol! It is SO GOOD! We ate half of it the first night and there are just my husband and myself at home these days!!! I made this cinnamon swirl banana bread, it came out perfectly and moist. Thanks for the recipe. I will make this again, next time will add walnuts. It was good. I substituted all purpose gluten-free flour and used splenda sugar. White sugar is the same measurement, brown sugar 1 1/2 tbsp. 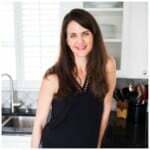 My husband is diabetic and I am gluten free. It was awesome! If I’m ever feeling down about myself, I’m going to remind myself that I made this banana bread once. 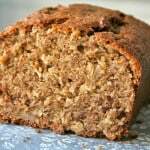 🙂 Honestly, this is the best banana bread ever and I consider myself a banana baked goods addict! Thank you for this amazing recipe, which I stumbled upon and am so grateful to have discovered. All the best to you and your family! I just made this bread this afternoon. The only change I made was to add in a handful of chopped walnuts. This bread defined in one word…… SCRUMPTIOUS! It is ABSOLUTELY AMZAING!! And by the way, I’m a pastry chef. 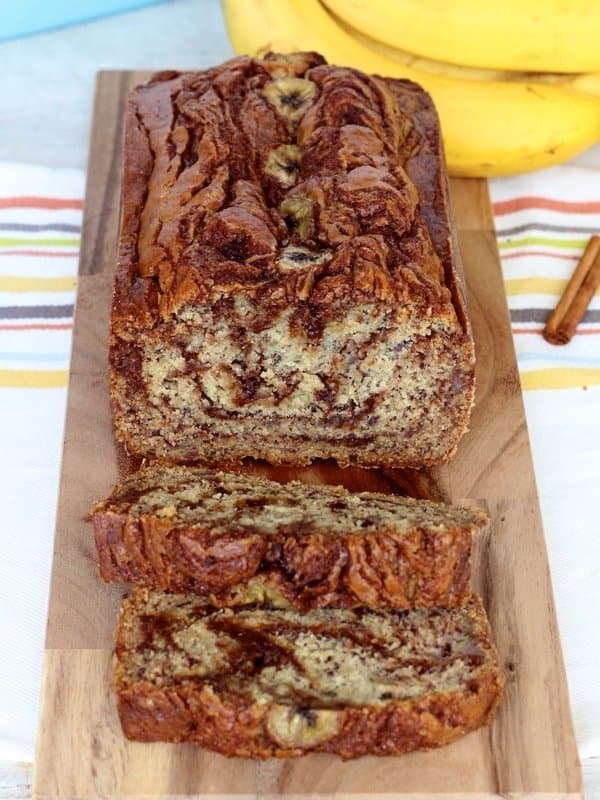 I’ve have my fair share of banana breads claiming to be the “BEST EVER!” This one, well………. It would truly be hard to top!!! Hi Bridget! Love that you added chopped walnuts! Yummm! Makes me so happy that you love this bread as much as we do. Thanks for sharing & enjoy!! Yay Dana! Isn’t it so amazing?! Thanks for sharing. I’m so glad you love it! Enjoy! I love this recipe it’s my favourite. Used it all last winter. This time I used chocolate chips and walnuts. Lol thanks for the recipe. This is the most amazing twist on banana bread I’ve ever made. It is absolutely delicious, moist and easy to put together. Thank you for such a great recipe. The family loves it!! Hi Mike! Of course, but I haven’t tried so I can’t confirm how long it should take to bake. I would guess that the baking time will decrease because the batter will be spread a bit thinner. Just check on it often as it bakes. When it looks set and a toothpick inserted throughout comes out clean, it’s done. Enjoy! Oh no, Sarah! Are you baking it in a 9×5 loaf pan? I made this twice now. I will never go back to regular banana bread. I did add a cinnamon streusel topping. It takes a little longer to bake,but totally worth it! Thank you! Just wondering if I can freeze it! It looks delicious! Hi Laura! Absolutely, just wrap the loaf in plastic wrap several times tightly and put the wrapped banana bread into a large freezer storage bag. The bread stays fresh for 2-3 months in the freezer. Enjoy! Made this early this afternoon can not wait to taste it later with a cup of tea! Yay! You’re sure to love it, Christina. Enjoy! This is my favorite banana muffin recipe. I add extra pecans and the muffin just melts in your mouth. Always a hit in group gatherings! So great to hear! I love that you bake the recipe into muffins and add pecans. So yummy!